Do You Know the Way to ConJosé? Doesn't seem that long ago, but the last time we had been to California was back in 1999 when we were the fan guests at the Anaheim NASFiC. We didn't get to see very much outside the Anaheim Marriott then, so the last time we actually got to do a bit of vacationing in California was back in 1996, just prior to L.A.Con III when we spent a weekend in San Francisco, then drove down to L.A. via Ventura. That was a pleasant week, so we decided to do it again, more or less, but in the opposite direction (starting in Los Angeles this time), since the 2002 Worldcon was in San José, not Anaheim. Things did not get off to a good start. The United Airlines flight from Baltimore was more than an hour delayed due to some kind of mechanical problem with the airplane (they ended up using a different airplane for the flight), so we missed our connecting flight from Chicago. Luckily, there was another flight to L.A. about an hour later, but it turned out our luggage didn't make that connection and arrived at LAX about another hour after we did. And when we finally tracked down the luggage, one of the suitcases had been badly damaged en route (the zipper had been mostly torn out). By that time, it was about 8:30pm, so we decided to take it up with United after we got to San José; we needed to find our hotel in the Van Nuys area then meet up with Craig Miller and Genny Dazzo, who were going to give us directions to their home for dinner the next evening. Due to more problems with the rental car, we didn't make it to the LASFS clubhouse until only the last few hangers-on were still there, but one of them, the writer John DeChancie, offered to lead us to the after-the-meeting restaurant where LASFS members often went. For once the timing was good -- most people were just getting their food orders, and Craig and Genny were there. They told us they weren't too worried, as they figured we'd find a way to contact them if we didn't show up. We told them they have more trust in our people-finder abilities than we did! Genny and Rich had been talking about lasagna recipes at Midwestcon earlier in the year, which had led Craig and Genny to invite us to their home for a lasagna dinner. And, since you can't bake lasagna for just four people, they also invited some of their friends (all of whom were involved in some way with the television and film industry). Since the Washington area SF fans' career interests tend to revolve around government, it was interesting to listen in to a totally different topic that was the main interest of a different part of the country -- the movie business. There were many interesting stories that night, and we had such a good time listening to them Rich never did get to tell any of his Eastern Europe adventures. It turned out that Genny had been preparing the lasagna for about three days! (Some things, including a good lasagna meat sauce, you just can't rush.) She also collects teapots, something we'd known for a few years (we've contributed several, in fact), but this was the first chance to see the collection. It was huge! She must have at least 500 of them, probably more, and they are all on display on shelves and bookcases in her dining room. They range from the large to the tiny, from the prosaic to the ornate. On the way north to San Francisco, we found her a teapot shaped like a pumpkin in a second-hand consignment store in Ventura. It was different enough to be interesting, but after seeing her collection, we weren't entirely sure she didn't already have it! 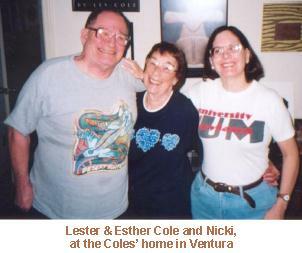 A day and evening in Ventura visiting our friends Lester and Esther Cole was next on our schedule. We first met them back in 1993, at the San Francisco worldcon, and both of them have written essays we've published in Mimosa. Ventura's downtown area has been transformed since we were last there into mostly a touristy area of antique and consignment shops and restaurants, with a regional attraction of one of the Spanish Missions that were built along the California coastline back in the 1700s. Definitely worth a day there, but our schedule didn't allow us to stay any longer than that. Next on our itinerary was a visit to the Hearst Castle, about three hours drive north from Ventura. The nearest town to the Castle is San Simeon, but we decided to stay the night instead about 10 miles south, in Cambria, which looked to be a more interesting place. And it was! The main street was lined with lots of little craft and antique stores to explore, and there were also many good places to eat. At one of them, where we stopped in for an evening snack, we were introduced to a local delicacy, the olallieberry, which seems to be a cross between the raspberry and blackberry -- chocolate olallieberry bread pudding with whipped cream is just too good, actually, to adequately describe in print. As for the Hearst Castle itself, it greatly exceeded our expectations, and we don't think we've been in a building that's comparable -- it's a mansion that aspires to be a palace. The building and grounds now belong to the State of California, and it's not run like a typical state park -- there's an IMAX theater in the welcoming center that shows a 40-minute dramatization about the construction of the place and several guided tours to choose from to see the place (you can't just get a grounds pass). We chose the Hearst Castle 101 tour (or whatever the name of the introductory tour was called), which, after an exciting bus ride up a narrow, winding road, took us through most of the ground floor of the main building. And from there, it was on to San Francisco. The Internet found us a good hotel deal -- a $65 per night double at the Renoir Hotel, just off Market Street. Unfortunately, the San Francisco Giants were playing in Colorado, so we didn't get to see the new PacBell Park, but we had more than enough other things to do to fill the two evenings and a day we were in the city. One problem with having just two evenings in San Francisco is that you can only go to two different restaurants for dinner. One of them was The Stinking Rose, the garlic-themed restaurant, which was as good as we remember it from 1993 and 1996. We met up there with a fan from the Washington club who was on her first visit to the West Coast and showed her around Chinatown after dinner, which was its usual mesmerizing human kaleidoscope. We'd also intended to go to Des Alpes, a limited-menu Basque restaurant (where we'd taken Guy Lillian, Teddy Harvia, and some other fan friends, back in 1993 during the San Francisco Worldcon), but to our dismay it was gone! Where it had been was now occupied by a Chinese-owned business, proof that San Francisco's Chinatown has continued to expand in the time since we were last there. Change is inevitable, but we'll miss Des Alpes -- we'd gone there for dinner whenever we were in San Francisco, and it was like an old friend. And then, finally, it was time for ConJosé. This was the 20th Worldcon we've attended (our 15th in a row). We guess that means we're no longer neos, but subjectively, the 1970s don't seem that long ago. It was not the most smoothly-run convention we've ever attended. We'd decided to stay at an outlying hotel, mostly due to waiting three months after the hotel blocks were opened before booking a hotel room (we never thought that $130-a-night hotel rooms would sell like hotcakes). But if we'd successfully gotten into what would have been our first choice, the Hyatt St. Claire in downtown San José, we'd have most likely have gotten a rude surprise. Some screw-up with the convention booking service had resulted in a large overbooking for that hotel, and many people who'd thought they would be staying in the downtown instead found themselves out at the Hyatt near the San José airport, the better part of an hour's commute away by the county's slow-moving light rail. The convention itself didn't do too much better than that the first day -- the registration people had apparently had some kind of problem with their membership database which resulted in them not having membership badges for any pre-registers whose last name began with the letter N. Pocket programs weren't available until that afternoon, either, which made it difficult for a while to figure out which events were going on where. Originally the convention was to have been held in San Francisco, but problems with hotel and/or convention center availability resulted in the venue shift a few months before the site selection vote back in 1999. We think we would have probably preferred San Francisco, but downtown San José is not a bad place to be. Many of the convention attendees took some time off to visit some of the local attractions, like the strangely-constructed Winchester Mystery House and the Tech Museum of Innovation. The one we went to see was the local Museum of Quilts and Textiles, which had a display of quilts on the topic of "The Last Year" -- some stark images of the elderly during their final weeks. The quilts were done in a realist style to be almost indistinguishable from portraiture paintings when standing farther away than about ten feet. But it was not really morbid; the images were actually quite compelling -- worthy remembrances of people who had accepted death, and were meeting the ends of their lives with dignity. Parts of San José itself seemed rather morbid, but in a dignified way. There were many empty and abandoned storefronts along the street where the light rail ran, presumably where dot-com companies had once been located before the bubble burst, awaiting new life when the economy turns upward again. The local economy had other ways of coping, though -- there was a large street craft fair in downtown San José the weekend of ConJosé, similar in scope and content to the Sugarloaf Craft Festivals here in the Washington, D.C., area, with hundreds of vendors. Thousands of people braved the hot weather to browse, and eat, and buy. We bought a silver armadillo pin for a friend of ours from a craftsperson who told us he liked to read science fiction, and who was amazed to find out that the World Science Fiction Convention was taking place just a short distance away from him. A bit earlier, Rich had talked to another craftsperson who was selling ornate little wooden boxes of the kind he'd seen during his Russia trip back in 1994. When he told her that, she asked where in Russia he'd been, and was rather surprised when Rich mentioned that one of the places was the Siberian city of Krasnoyarsk -- originally her home. It really is a small world! There were many friends of ours at ConJosé from all around this small world. Janice Gelb, who lives maybe 15 miles from San José, was trying her best (with mixed results) to stay out of convention operations long enough to attend much of the convention. Adrienne Losin, who lives south of Melbourne, Australia, stayed hidden so well that we didn't cross paths with her until near the end of the convention. One unexpected treat, on the last day of the convention, was the discovery that British fan Ron Bennett, the 1958 TAFF delegate (and Mimosa contributor), was at the convention for that one day. He was actually in the States to visit his son, who edits a Silicon Valley-based computer trade journal of some kind, and just showed up unannounced. The only reason we found him at all was because of a chance remark of a bookseller friend of ours who'd sold him a book in the dealers room. It was a chance remark of a different sort that led to the most-repeated story of the convention. Australian fan Stephen Boucher, who comes to the U.S. so often that he's become part of midwest fandom, had been asked, in jest, if he was interested in bidding Australia for the 2005 NASFiC convention. Stephen replied that if he was going to bid for a convention the scale of a NASFiC, he'd rather bid for a Worldcon instead. Bingo! Twenty-dollar bills for pre-supporting memberships immediately began piling up in front of him. Before another day had passed an 'Australia-in-2010' bid shirt had been produced and a web site was online. A somewhat dumbfounded Stephen was later heard to remark, when asked if he was going to be the Chairman, "I'm just the hood ornament on this bulldozer." And thus are worldcon bids born and fan history created. ConJosé seemed to do a better job of creating fan history than showcasing it -- there seemed to be fewer fan history-related programming items than at other recent worldcons. In fact, maybe the most interesting fan history-related hour (for Rich, at least) of the convention happened at a room party, where he and Ben Yalow took the opportunity to describe some of the things that happened in fandom of the 1940s, `50s, and `60s to an interested fan named Janis Ian. After the convention, Rich sent her a copy of the 1950s fan history book he had edited and she sent back two of her CDs. Fair exchange. What ConJosé lacked in fan programming, it made up for in a Fan Lounge. An upper floor of the main hotel had two large suites -- one was used as the Con Suite and the other became the Fan Lounge. Depending which way you turned getting out of the elevator, you found one or the other (and, from the looks of puzzlement, not always the one that was expected). As the Fan Lounge was the one with all the fanzines and fanzine fans, that's the one we spent time in. It was a place of relative quiet and good conversation as well as lots of good food, which made it a preferred breakfast spot. The Con Suite also had lots of food, much more than even fans could consume, and they had enough to stock a small grocery store when the convention ended. Since this was the Con Suite, it was usually very busy and very, very noisy. It was also a bit dark as, unlike the Fan Lounge, the window curtains were usually kept drawn. Nicki found out why on our second day there. While sitting and talking with Dave Kyle in the Fan Lounge, she noticed an airplane. Downtown San José, it turned out, was in the landing path of the airport and there was a perfect view from the Fan Lounge of each airplane preparing to land. Too perfect, actually. As she watched, the airplane got closer, closer, closer, closer, and just as you could clearly see the landing gear coming down, the plane veered to the right and receded from view. Every few minutes the performance was repeated; it was all a bit unnerving. Nicki eventually decided it was time to either sit where she couldn't see the planes or go watch some programming. Five days for a worldcon seems a long time, but it usually goes by in a flash and ConJosé was no exception. The last major event of the convention was the Hugo Awards; we had been nominated in the Fanzine category, for Mimosa, for the twelfth year in a row, but lost by 19 votes to Dave Langford's Ansible. We weren't really expecting to win, as it's been a few years since the last time we had, but we were a bit surprised that Ansible was the winner -- California resident Mike Glyer, who had won the award (for File 770) the past two years, had seemed the clear favorite. There are many memories we'll keep from ConJosé. Patrick Stewart's unpublicized event the Friday night of the convention was one of them; he came to ConJosé primarily to promote the upcoming Star Trek: Nemesis and X2: X-Men United movies, but the 45 minutes he was on-stage showed him to be engaging and entertaining -- somebody who was much more than just a talking head. 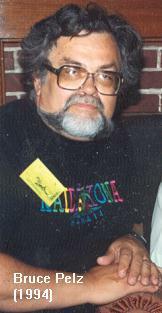 Another was the Bruce Pelz remembrance event -- Bruce wasn't a religious person and there was no memorial service for him after his death in May, so instead his friends held informal secular wakes for him at this year's Westercon and also at ConJosé, where we had a final opportunity to say good-bye. Saying good-bye to California is never easy to do, but after two weeks of vacation and convention, we were ready to come back home. The return trip was uneventful, but it was almost midnight by the time we got home and we both had to go to work the next day. By the time we'd gotten fully caught up with the real world, ConJos� had receded several weeks into the past and the only mention we saw of it was the occasional review in fanzines and online. I am truly at a loss for words, and I don't want to be because Bruce's friendship has been one of the constants in the nearly three decades I've been actively a science fiction fan; he was someone I looked forward to seeing, more than anybody else, at worldcons. Living a continent-width away, our paths crossed only too infrequently. 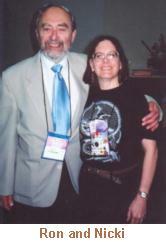 Bruce's presence over the past two decades has been a huge influence on my interest in the history of SF fandom. Nicki and I decided to publish Mimosa, a fanzine dedicated to fan history, in large part because of Bruce and other fans interested in preservation of our past enthralled us with entertaining and interesting stories about fandom's past eras. We regret we didn't try harder to get Bruce himself to write more about his decades in fandom -- Bruce only preserved one of his stories in print for us. [It appeared in M27]. It's getting so that every time that I meet up with an old friend I haven't seen in a long time, I feel I need to treasure the moment because there's a chance there might not be another time. I never thought this about Bruce, though -- he was a rock, a constant, someone who's presence I always took for granted. I cannot for sure even remember the very last time I spoke to him in person, though it was sometime during the 2001 Philadelphia worldcon. It was probably when we went to dinner on the Saturday night of the convention; he was ailing from leg pain and moving very slowly. 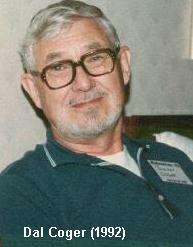 I remember that we shared about an hour's worth of conversation, on topics ranging from places in the world we wanted to go back to (he was a world traveler in his final years) to what we thought would make good fan history projects in the future (including my still incomplete 1960s fan history). It was there that he told me the story that he later put into print for Mimosa. Bruce's passing is truly the end of an era. I think he will be remembered as one of the most important and most influential fans of all time, and certainly as one of the most active. The list of his activities and accomplishments is enormous, covering almost every activity imaginable from convention running to costuming to fanzine collecting to organizing. He was active in fandom in six different decades. He was truly a fan for the ages, and now he belongs to the ages. I already miss him very much. Dal's activity in science fiction fandom began in the midwest U.S. about 1942, when he attended the second Michicon in the fall of that year. He was only active for a couple of years before he went into the military for World War II, but in that time he became friends with Al and Abby Lou Ashley and other people in the Galactic Roamers fan club in central Michigan, and as a result, spent many happy days at the most famous fan abode of all time, the legendary Slan Shack of Battle Creek, Michigan. Of that place, Dal later wrote that "fan visitors from far and wide came by to enjoy the Ashley's hospitality." Because he became stationed thousands of miles away, in California, Dal wrote that "I was immensely unhappy that I couldn't [often] share in this." It was actually Dal's good fortune to be stationed at Camp Haan, in southern California, for his basic training, and during the relatively short time he was there before being shipped off to France, he became friends with the LASFS crowd, including Jim Kepner, Forry Ackerman, and the enigmatic Francis Towner Laney. Dal later wrote about that time, mentioning that "I was permitted to flop over the weekend in the [LASFS] clubhouse [on Bixel Street], and frequently spent Saturday nights there while on a weekend pass. Forry Ackerman and Morojo had made me welcome." It was more than 20 years of gafiation after that, first in the military and then in academia -- Dal became a professor at the University of Memphis (Tennessee), where he was a notable historian and African Studies writer. He re-entered fandom in the mid 1970s, and became a sort of patriarch for Memphis fandom after that. I met Dal not long after his re-entry into fandom, at a small convention in Arkansas where he was Toastmaster and introduced me to the convention's Guest of Honor, Bob Tucker. Dal and I stayed in contact with each other after that; it was probably our common interest in history, especially the history of science fiction fandom, that helped make us friends. And even though most of his time was still absorbed by academic interests, both before and after his retirement sometime in the 1990s, he still found time for some fan writing; I am pleased that Nicki and I were allowed to publish two of his fan history-related articles in Mimosa. He was also a great conversationalist, and the times we met each other at conventions usually resulted in a couple of hours of shared stories (mostly his), about travels and times past. These were fascinating to listen to. After Nicki and I moved to Maryland near the end of 1988, Dal and I crossed paths only every year or two, usually at Midwestcons we both happened to attend. The most recent time was this past June, and I remember him looking very energetic and healthy, much younger than his 80+ years. For that reason, I don't think I ever thought that might be the last time I'd ever see him. Unfortunately, I won't, and I am still trying to come to grips that. I am going to miss him greatly. Midwestcon 54 is less than a month away as this is being written, and friends of Bruce and Dal will be there. We will, too -- we look forward to further celebrating their lives and we won't mourn their passing. We hope you'll do the same for Mimosa.